I believe I’ve talked about this before, but I doubt anyone would think I exactly exhausted the subject. And besides, my recent trip gave me much opportunity to think about worship. I have discovered that I frequently have my most interesting insights on a given topic while I am talking to someone aobut the topic. And in the Philippines, I had much opportunity to talk about worship and the Reformed view of worship, and hence, much time to think about it. Many of us traditionalists feel there is something off-putting, something vaguely profane, about contemporary worship modes. Personally, I tend to feel soiled after such a service, like if I watch a movie with content I shouldn’t be watching. In such a movie, there are certain images, certain themes, which may get left in my head and pop back in and cause me trouble for years. Likewise, in such a worship service, I am treated to certain theological images and themes, which, while very seductive to the human soul, can be far more damaging even than images of a more carnal nature. In both kinds of worship, there is always a worship leader. And the difference between the two services can be perhaps best be characterized by the difference in what this worship leader does. In one kind of worship, the worship leader, who is usually the pastor, along with whatever instruments / choirs / whatever are supporting him, help the congregation through song, readings, confession and prayer verbally express their praise for Jehovah. Modeled after the Psalms, this will be on two topics- who God is, and what He has done. This can and should be a very emotional experience, but the emotion of it will always be the result of the truths expressed. In the other kind of worship, the worship leader, who is usually someone younger and more attractive than the pastor, along with whatever bands or singers are supporting him or her, directly create an emotional state with the audience through performing arts which, since Jesus’ name is associated with what is being done, is called worship. And so, though they say they’re doing the same thing, helping the audience worship, what they mean by that is very different- by ‘worshiping’, what they mean is, achieving a certain emotional state. I would assert that the first mode is real worship, and the second, manifestly, is not. Worship is the human being’s highest function. We were created to glorify God, as was all else that was made. To glorify God is to reveal who He is. God is so great and so good that to talk about who He is and what He has done is inherently to praise Him. Worship then must be focused on who God is and what He has done, as the Psalmist tells us- Praise Him for His mighty acts! Praise Him according to His excellent greatness (Psalm 150:2)! 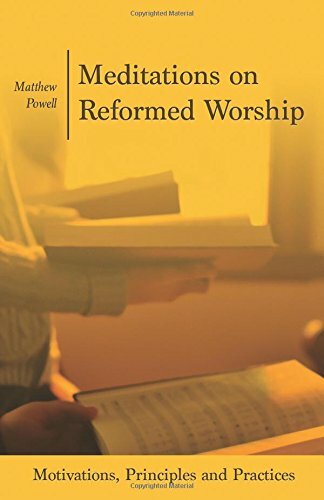 But contemporary worship, insofar as there is any content in it at all, focuses primarily on how I feel about God. It is not praising God to say how much I love Him. In fact, it may just be praising me. Certainly, when I talk about how much I love God in response to the truth of who He is and what He has done, then that can truly be praise and worship. But an emotional state is not worship. Worship is glorifying God. And the style of music is not irrelevant either. A style of music which is performace-oriented, directs attention to the stage and the performers, and is of a level of volume and production as to make it fairly irrelevant whether anyone in the congregation is singing or not, is not a worshipful style of music. It has nothing to do with what instruments are used or when the song was written. It has everything to do with what you think you’re doing when you worship, and whether your music supports that purpose or detracts from it. Hopefully, you now understand why a contemporary worship service makes me feel vaguely unclean. It’s kind of like watching a dirty movie to me. Images are shown and themes are expressed which are perversions of very important truths. And those images and themes are very seductive, because they play right to the heart of what makes us sinners- the desire to have a self-centered worship and a self-centered life. They take things which of themselves are beautiful, and twist them to serve man’s selfish ends. And sometimes those images are hard to get out of your head. In writing this, I’ve recalled some other blog posts on the topic which are quite appropriate as well: Here’s one from an anonymous Reformed blogger, and I can’t find the others that I’m thinking of, at least not without spending more time than I spent writing my own article which seems kind of silly to do.